1. 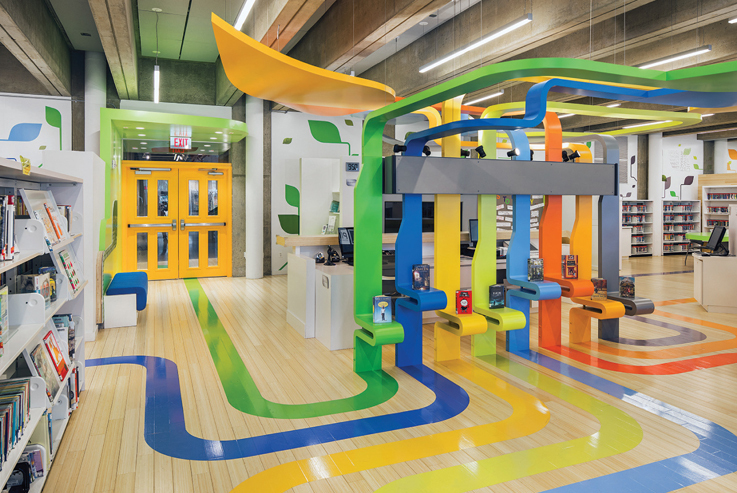 Based on development principles in learning behavior, the “Tree of Knowledge” centerpiece of the Jackie and Harold Spielman Children’s Library, Port Washington Public Library, NY, serves as wayfinding to specific spaces through the display of inspirational words: play, imagine, think, create, and connect. CREDITS: Architect, Lee H. Skolnick Architecture & Design Partnership; Contractor, Stalco Construction; ©Jonathan Wallen 2018, photo. 2. Expressing the history of its communities, the new Route 9 Library, New Castle, DE, carries the theme of a great tree under which residents can gather, learn, share, and build knowledge, based on a local landmark and carried through from the exterior metal panels evoking a canopy to the photo montage in the café. CREDITS: Tetra Tech & Perkins + Will, architects; Mark Herboth Photography, photo. 3. Long clear span trusses eliminate columns in the open spaces of the new Five Forks Branch, Simpsonville, SC, part of the Greenville County Library. 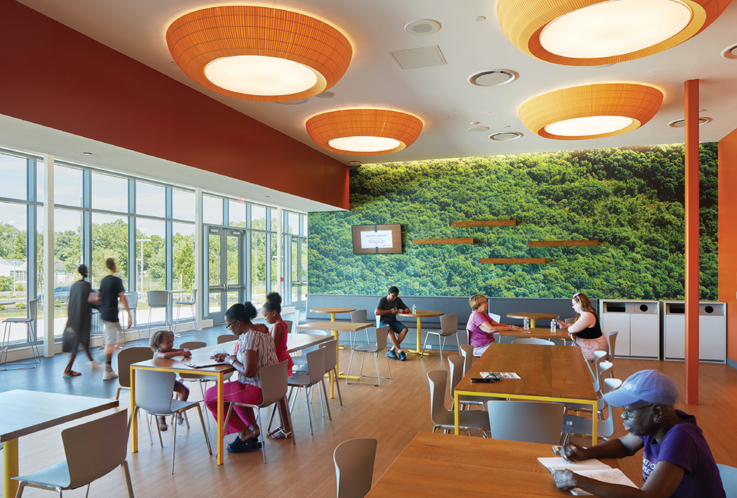 In the designated children’s room, the design allows for maximum flexibility and visibility. CREDITS: McMillan Pazdan Smith Architecture, architect; Firewater Photography, photo. 4. 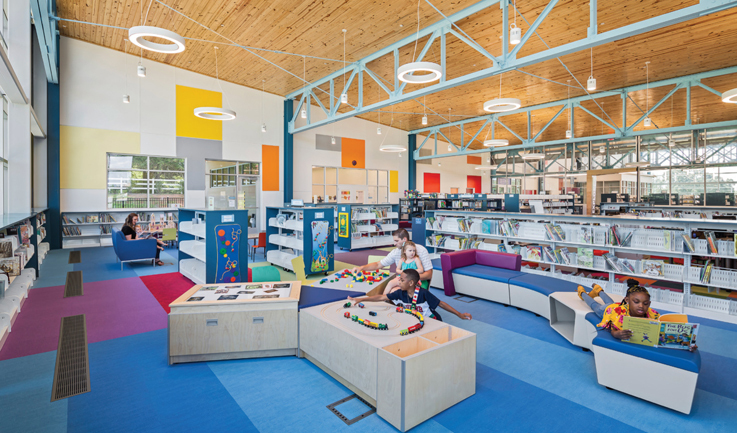 The John Hughes Cooper Library, aka Richland Library Cooper, Columbia, SC, speaks to the patron base of mostly retirees and young families through three studio themes: library as playhouse, as bookstore, and as garden. CREDITS: Boudreaux, McMillan Pazdan Smith, & Margaret Sullivan Studios, architects; Firewater Photography, photo.